Heinz is launching a limited edition can to mark half a century since its iconic advertising slogan ‘Beanz Meanz Heinz’ was first penned. The commemorative design will be sold exclusively through Selfridges along with 50 collectable cans personally signed by Maurice Drake, the advertising copywriter who came up with the slogan back in 1967. Over the last 50 years, the slogan has seen many iterations and has become part of the English language, from the original up-tempo jingle in the 60s to Ian Botham in the 80s and when it last appeared on TVs in a triumphant return in 2009. Today one can of Heinz Beanz is sold in the UK every 17 seconds. The limited edition Beanz Meanz Heinz can has been designed to express the collective love that people have for Heinz Beanz. 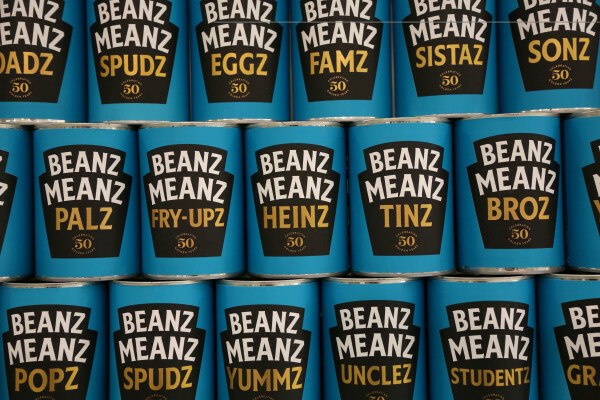 The artwork features 50 different iterations of the Beanz Meanz Heinz slogan using words that illustrate what Beanz means to UK households across the country. Phrases include Beanz Meanz… Yummz, Famz, Chatz, Spudz, Eggz, Morningz and Brekkiez. The cans will be available exclusively in the Selfridges Foodhalls in London, Birmingham and Manchester from 13th March priced at £2 each. To honour the tagline’s creator, Heinz has also produced 50 collectable cans for Heinz Beanz super fans. The can features a collage of contrasting Heinz keystone logo designs, as well as details of the slogan’s origins. Each can is numbered between one and 50 and has been personally signed by Maurice Drake. The cans will be on sale exclusively on Wednesday 5th April at Selfridges London Foodhall and via the Selfridges website, with sales limited to one purchase per person. This rare collector’s item will be on sale for £10 per can. All Heinz proceeds from the sale of the limited edition and collectable cans will be donated to The Ideas Foundation, a charity that identifies and nurtures creatively gifted 13-19 year olds, as well as working to increase diversity in the creative industries.